In Wisconsin, groundwater is an abundant and essential resource. It provides drinking water for 70% of Wisconsin citizens and is linked to the health of our surface waters, including wetlands. Lakes, rivers, streams, wetlands, and groundwater are part of a single hydrologic system where water is continually exchanged above and below ground. A common way groundwater enters surface waters is in areas where the water table—the area below which the ground is saturated—intersects the land. These areas, often described as springs or seeps, provide continuous sources of base flow for many of Wisconsin’s wetlands, lakes, rivers, and streams. In fact, shallow sub‐surface groundwater is the primary source of water for many of Wisconsin’s wetlands. In some places, wetlands can also recharge groundwater. Groundwater fundamentally shapes the quality and function of these wetlands, including their capacity to support fish and wildlife. For example, the continuous discharge of groundwater to wetlands helps maintain the seasonal water levels and types of plants needed by waterfowl to breed, nest, feed, and hide. Groundwater input to wetlands becomes particularly important in years with less rain or snow. The low oxygen environment of groundwater‐saturated wetland soils supports specialized bacteria and plants that remove nitrates from the soil and water. This helps keep surface water clean and healthy. Groundwater-fed wetlands also serve as the headwaters to many of the state’s cold water trout streams. 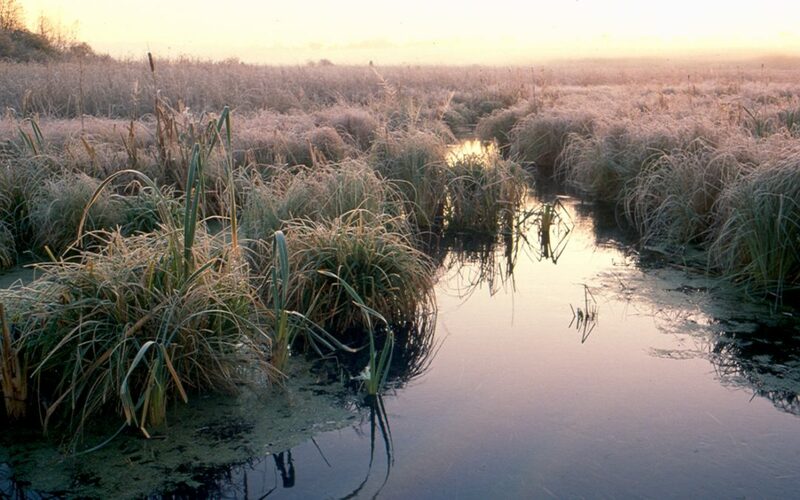 These wetlands provide a continuous source of clear, cold water which trout depend on to survive and thrive. Farther downstream, groundwater-fed wetlands also help lakes, rivers, and streams maintain steady water levels and water flow rates. Groundwater and wetlands are both important water resources in Wisconsin, and both these resources need each other to stay healthy. You can learn more about groundwater in Wisconsin on the Wisconsin Geological and Natural History Survey’s website.